If you’ve been wanting to know more about what Ottawa’s South March Highlands is all about, then Saturday, June 2, 2012 is the day! From 9 a.m. to about 2 p.m., there’ll be a celebration at the Conservation Forest part of the Highlands. The event coincides with the South March Highlands’ recent win as the National People’s Choice Award for Public Spaces in the Canadian Institute of Planners’ Great Places in Canada Contest. Walking and bike tours of the Forest, including a family-friendly guided tour of plant life with Martha Webber, and others of varying lengths, will start at 10 a.m. Displays on wildlife, turtles and geology of the area also start at 10. There’ll be live music and children’s games throughout the day. Opening ceremonies with Algonquin Elder Albert DuMont start at 9:30 a.m, and the official presentation of the People’s Choice Award happens at noon. Check for updates at the South March Highlands website or the Facebook page. 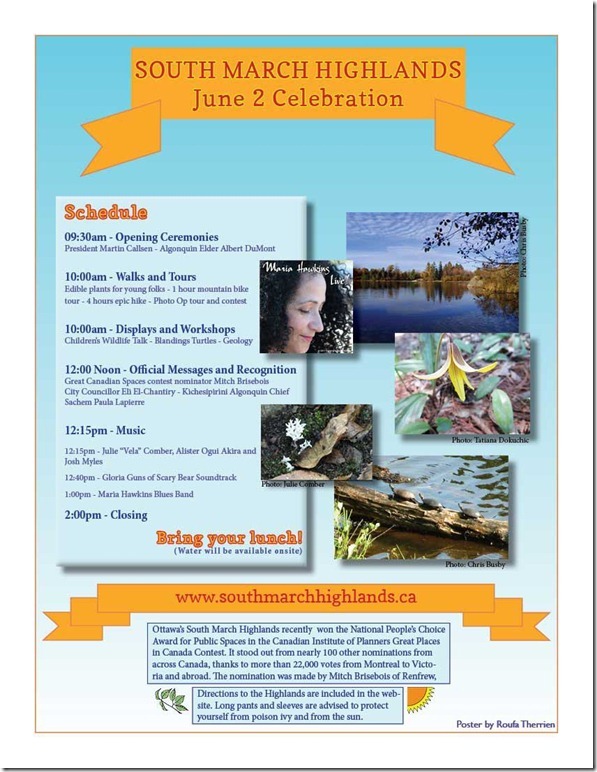 You can find helpful directions to the event, which takes place at the trailhead for the Conservation Forest at Second Line Road and Klondike Road, at http://www.southmarchhighlands.ca/about-the-southmarch-highlands/how-to-get-to-the-june-2-celebration/. The South March Highlands is a wilderness area right in Ottawa that’s home to over 650 species, including 18 at risk of extinction. Algonquin First Nations consider it sacred, and it’s of interest geologically and archaeologically. Although it’s rated as a provincially significant natural area, much of it is not protected from development. Kudos to the Celebration organizers for helping us get to know it. Another season of Ottawa Urban Wild Tours is underway. The tours, organized by Transition Ottawa members, are intended to help us “discover hidden corners of our neighbourhoods and become acquainted with the wonders of nature in the city.” Each walk is guided by naturalists and lasts 60-90 minutes. This Saturday, June 2, 2012 is a night walk to look for night moths and other insects. The tour will start at 8:30 p.m. at the Clyde Woods, weather permitting, and you’ll need to bring your own flashlight. Check the Urban Wild Tours website for updates and registration information. Other upcoming tours are the Birds of Bytowne June 23, Wild Edibles on July 15, and Macoun Marsh Biodiversity on August 11. Amber Westfall’s Plant Walks continue monthly throughout the spring and summer; the next one is Flower Power on June 23, 2012. The Ontario Urban Forest Council, in collaboration with Ottawa Forests and Greenspace Advisory Committee, the Central Experimental Farm and Tree Canada, is holding a day-long workshop on June 8, 2012 on how to recognize, value and protect heritage trees and greenspace. Topics include how to research, protect and celebrate heritage trees, which are trees that have some cultural, historic or other significance. On June 9, participants can attend a tour of trees of the Arboretum, Rideau Hall, Richelieu Park in Vanier and the Champlain Park neighbourhood. Check the Council’s website for information on registration and cost.